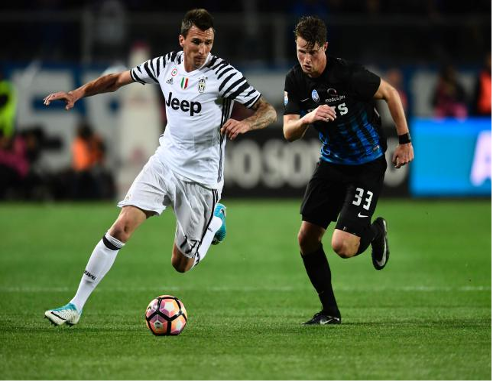 Swiss midfielder Remo Freuler bundled a timely leveller past Gianluigi Buffon at the death to grab a deserved share of the spoils for Atalanta in a 2-2 draw with Juventus on Friday. A great diving header from Dani Alves looked to have secured the three points for Juventus after Massimiliano Allegri’s treble-chasers fought their way back when Atalanta midfielder Leonardo Spinazzola’s own goal levelled Andrea Conti’s first-half opener for the hosts. But Atalanta would not give up the fight, and when Buffon first pushed away Freuler’s last-gasp drive, he could do little when the midfielder pounced on the rebound to fire in a last-gasp equaliser. Juve’s third draw of the campaign left the Turin giants, on course for a record sixth consecutive scudetto, nine points ahead of Roma, who face Lazio in the derby on Sunday. Juve travelled to Bergamo well aware of the danger from Atalanta, who took full points from Napoli, Roma and Inter Milan at their Atleti Azzurri d’Italia stadium earlier this season. And by the end of a confident first-half, Juve—who face Monaco away in the first leg of their Champions League semi-final next week—had reason for concern. The hosts started with a flurry, Hans Hateboer narrowly failing to reach captain Alejandro Gomez’s inviting low cross in from the left in the opening minutes. Juve struggled to find their rhythm, and after Rafael Toloi forced Buffon into action with a long-range effort the visitors had to wait until after the 25th minute to catch a sight of goal. A cross fell kindly for Gonzalo Higuain, but the Argentina striker’s volley was no trouble for Etrit Berisha in the Atalanta net. Making his 300th Serie A appearance, Giorgio Chiellini was caught out by Freuler, who forced Buffon to save with his legs. Juve finally awoke from their slumber, but after Chiellini swept a great cross towards the back post Juan Cuadrado missed the target with his side-footed volley. Chiellini was involved again with a great block on Leaonardo Spinazzola, but the veteran defender was powerless when the ball fell to Gomez to fire over for Conti, who jumped to meet the ball and fire inside the near post. When Juve levelled five minutes after the restart they had Spinazzola to thank after he headed past Berisha from Miralem Pjanic’s free kick, following a scything tackle on Dybala from behind. Juventus took command, two efforts in quick succession from Dybala and Higuain keeping Berisha on his toes. But Allegri’s men were ultimately wasteful. Juve’s penalty claims just before the hour, when Toloi jumped to challenge Bonucci at a free kick and caught the ball with his raised hand, were waved away despite protests because Mario Mandzukic was in an offside position. Gasperini added some firepower when he replaced Jasmin Kurtic with Franck Kessie on 66 minutes, but Juve remained a threat. Sami Khedira almost produced a stunner, his well-struck volley spinning towards the top corner before Berisha came to the rescue. The German came close again with a header from Miralem Pjanic’s corner that forced Berisha to parry. Juve were finally celebrating when Alves, timing his run to perfection to meet Pjanic’s delivery towards the back post, dived to head past a flailing Berisha. But all the good work was undone when Freuler kept his cool to fire off Buffon, collect the ball after it came off Andrea Barzagli and bundle home an 89th minute equaliser.